***UPDATE! Due to the Winter Storm headed our way, the Old Dominion concert at Grossinger Motors Arena has been postponed to April 14th, so there will NOT be a pre-party at Tony’s Tacos tomorrow. No concert, no pre-party, stay safe! 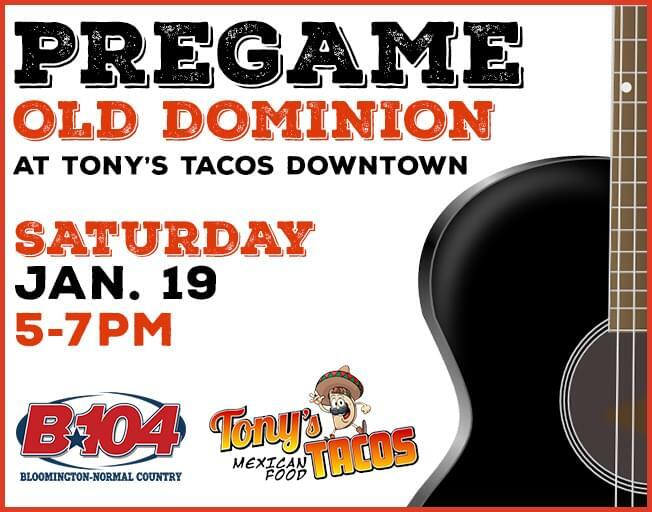 Join the B104 gang at Tony’s Tacos THIS SATURDAY from 5p-7p for our Old Dominion pre-party! Tony’s Tacos has two locations, but we will hold the pre-party at the Bloomington restaurant which is located at 105 W Front Street and is the CLOSEST place to grab some food and drinks before any show at Grossinger Motor’s Arena. Hang with us for the Old Dominion pre-party and then just walk across the street for the concert! Tony’s Tacos will have the upstairs and downstairs open for the pre-party, with a $20 special for anyone who wants to join us that includes their Nacho Bar and 3 beers (no limits on which beers). You will also be able to order off the regular menu as well. So, come and join us from 5-7 at Tony’s Tacos in Bloomington, THIS SATURDAY for a chance to load up on food and drinks. Then, just walk across the street to Grossinger Motor’s Arena with all of the Old Dominion fans for an incredible night of country music, with Bloomington Normal’s #1 Country, B104!